A new guide on how to complete inventories on tenant ‘check in’ and ‘check out’ has been designed to help landlords and agents avoid tenant disputes over fair deposit deductions. The guide is produced by the Tenancy Deposit Scheme (TDS), the Association of Independent Inventory Clerks (AIIC) and the Association of Residential Letting Agents (ARLA). Accurate inventories are vital for providing proof to support claims to deduct repair and replacement costs from tenant deposits. From 01 June 2019, the Tenant Fees Act comes into force, from that date, the maximum refundable tenancy deposit that a landlord can request is up to 5 weeks worth of rent where the total annual rent is less that £50,000.00. Tenant Fees Act 2019 – comes into effect on 01 June 2019. What fees can you ask a tenant to pay? When does the ban apply? 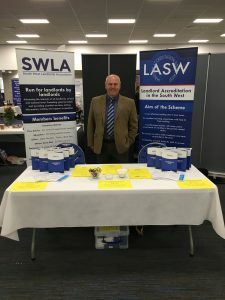 On Tuesday 2nd April 2019, Iain Maitland (Vice Chair), Gillian (Office Manager) and Anna (Senior Administrator) attended the Landlord Expo event in Bristol organised by the 4 West of England Local Authorities. The theme of the event was ‘The Key to Staying Ahead’ and was open for all landlords in the private rented sector. There were seminars throughout the day, 60 exhibitor stands and was well attended by landlords. The next Expo that SWLA will attend is the Teignbridge Landlord Open evening on Thursday 23rd May from 4.30pm – 8.30pm at Old Forde House in Newton Abbot. All private landlords are welcome to attend.